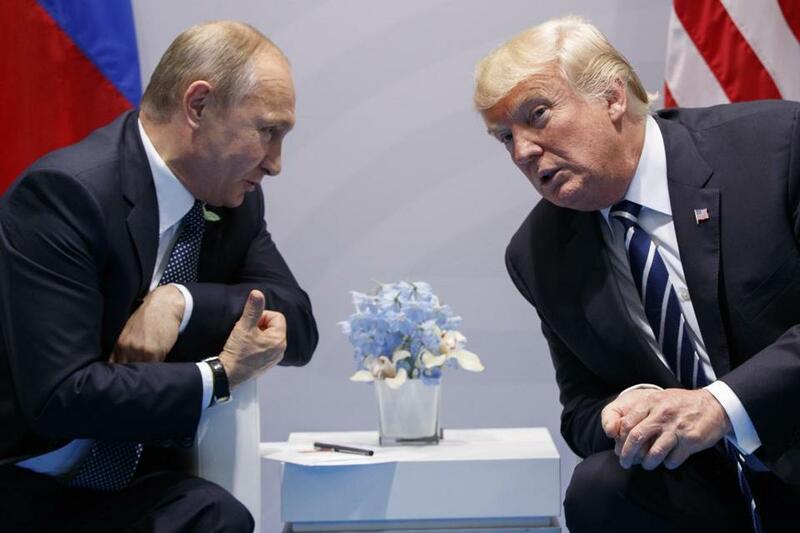 President Trump and Russian President Vladimir Putin spoke in 2017 at the G-20 summit. WASHINGTON — Even as the special counsel expands his inquiry and pursues criminal charges against at least four Trump associates, House Intelligence Committee Republicans said Monday that their investigation had found no evidence of collusion between Donald Trump’s presidential campaign and Russia to sway the 2016 election. Representative K. Michael Conaway of Texas, who is leading the investigation, said committee Republicans agreed with the conclusions of US intelligence agencies that Russia had interfered with the election, but they broke with the agencies on one crucial point: that the Russians had favored Trump’s candidacy. The announcement brought to an abrupt end to one of two remaining investigations into the topic on Capitol Hill and quickly provoked sharp objections from committee Democrats, who have warned Republicans not to close the matter before the special counsel, Robert Mueller, is done with his work. Schiff and intelligence officials also disputed the Republican finding that the country’s intelligence agencies had erred. The Republican findings hand Trump, who has dismissed the whole matter as a “witch hunt,” a convenient talking point even before Mueller interviews the president and possibly other key witnesses. Conaway said the committee would turn over a 150-page draft report to Democrats on Tuesday for review and comment. The document includes more than 25 recommendations related to elections and cybersecurity, counterintelligence practices, and campaign finance rules. He said the committee was preparing a separate, in-depth analysis of the intelligence community’s January 2017 assessment. Conaway said the panel interviewed more than 70 witnesses and reviewed more than 300,000 pages of documents and sent investigators to seven countries. Democrats say that effort has fallen well short of gathering all the evidence. Important witnesses have not been interviewed, and records have not been subpoenaed, including bank documents and certain communications that Democrats say are paramount to understanding the case. The committee’s final interview took place on Thursday with Corey Lewandowski, Trump’s onetime campaign manager. Several witnesses thought to be central to the investigation never came before the panel, including Trump’s former campaign chairman Paul Manafort; Manafort’s deputy, Rick Gates; Trump’s former national security adviser, Michael Flynn; and the Trump campaign’s former foreign policy adviser George Papadopoulos, all of whom are under indictment by the special counsel. Conaway said he hoped to work expeditiously with American intelligence agencies to declassify the report and make it public. He also said the committee would consider any significant new evidence that may emerge in the case in the future. But the day-to-day reality of running a closely watched investigation potentially implicating a sitting president left the committee badly frayed. Democrats have accused Republicans of essentially blocking their path to the truth to protect Trump. Republicans have countered that Democrats on the panel have turned private proceedings into a television spectacle to earn political points. Instead, Republicans and Democrats on the committee spent a month locked in an extraordinary dispute over a secret Republican memorandum that accused top FBI and Justice Department officials of abusing their powers to spy on one of Trump’s former campaign advisers. Republicans released the document over the objections of the Justice Department and the FBI, which warned in a rare public statement that it was dangerously misleading, and many used the document to argue that the entire Russia inquiry had been tainted by anti-Trump bias from the start. Democrats eventually wrote and released their own countermemo, drawn from the same underlying material, to rebut the Republican document. They are likely to write their own final report as well, outlining questions that remain unanswered. Representative Devin Nunes of California, the committee’s Republican chairman who had to step aside from leading the inquiry last spring, has made clear he will continue to push ahead with his own investigation of a dossier of salacious and unsubstantiated reports about ties between Trump, his campaign team and Russia’s interference campaign.